Left: This is the plan of the well sanctuary seen from above. 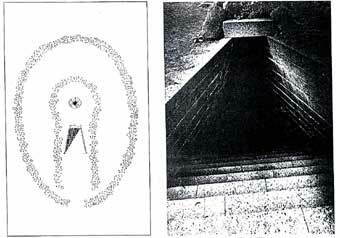 Small stone walls surround the steps which lead underground as well as the small hole of the dome at the surface of the earth. Right: The steps to the well temple of Santa Cristina are thousands of years old but could very well have been made only yesterday by modern stonemasons. The carefully cut slabs of stone fit tightly on top of each other without mortar.